Here are the results of what has become an annual ritual for me – designing a card to celebrate the New Year! This year there are three versions of the card – see my Pinterest board for a peek at the other two variations. Making these designs was kind of an involved process. The first thing I did was go through some monoprints I did back in the 1990s that I thought would make good backgrounds. These prints were “rejects” that I didn’t think were interesting enough on their own but I thought might be good as part of a collage some time in the future. Next I used some archival dye-based ink (Ancient Page and ColorBox Archival) to stencil designs on top of the background pieces. I chose this ink because it was translucent and I wanted the backgrounds to show through a little. Most of the stencils I used on the backgrounds were from a series that I cut out back in September consisting of designs inspired by a mid-century modern building I saw on a trip last summer. I drew a set of retro ornament shapes and cut them out of more monoprint scraps, and stenciled on them with some commercial stencils of geometric design. I thought they complemented the mid-century modern look quite well. I don’t know many more times I can go back to the well of inspiration that is retro ornaments – I have yet to get tired of them! The next step was to scan the background pieces into the computer and work on them a bit with Photoshop. I altered the colors a little bit on some of these to make them better backgrounds for the ornaments. The real life pieces will be used later in some art projects. I got some more use out of the backgrounds by making them into header images for Google+, Facebook and Etsy – I like to change those seasonally and without the seasonal references I won’t have to change these headers for awhile! Monoprint leftovers with stenciling on top and a little bit of computer enhancement and collaging. Next I scanned in the ornament pieces separately and used various Photoshop tools to trim around them and enhance the color a bit to make the stand out better against the backgrounds. I added a drop shadow and a grunge border and exported each composition as a JPEG to import into Illustrator. The card text and further details were done in Illustrator with the addition of the yellow texture imported from Photoshop. The texture was created with a technique I wrote about in my article Analog to Digital: Waste Paper From Stamping Projects Can Enhance Photoshop Art. The next step is to get these printed and mail them out ASAP! Usually my problem is an overabundance of ideas for new projects, way more than one human being can ever do. Occasionally I need a new idea for a certain specific purpose and I find myself coming up dry. This weekend I was trying to create a new Halloween greeting card design and decided to check out some card sketches to see if anything inspired me. I made a new Pinterest Board, Greeting Card Ideas and Sketches to help me keep track of my finds. I found a lot of sketches I like on a web site called CAS(E) this Sketch! They specialize in clean and simple designs which appeal to me because a lot of times I think paper crafts that I see out there have WAY too much “stuff” on them. I’m sure a lot of people think my own designs are too spare. That’s ok, we all have different taste. Here is my entry for sketch challenge CTS #137. Making this card helped me get over my creative block and I have some more spin-off ideas that really don’t look much like this result at all, one of them isn’t even for a card, but are things I never would have thought of if I hadn’t done this exercise. That’s how creativity often works! Yes it might seem a little early to talk about Halloween crafts – usually in early August I feel like I’m just getting used to the summer lifestyle. The Fall 2015 issue of RubberStampMadness is out and I want to let you know about it because my article “Stamping Halloween Postoids” is featured within! If you want to read it check the newsstand at your favorite craft retailer or go to the RubberStampMadness web site to order a copy. My four-page article will guide you step by step in creating your own Halloween Faux Postage stamps to decorate your Halloween mail and crafts. 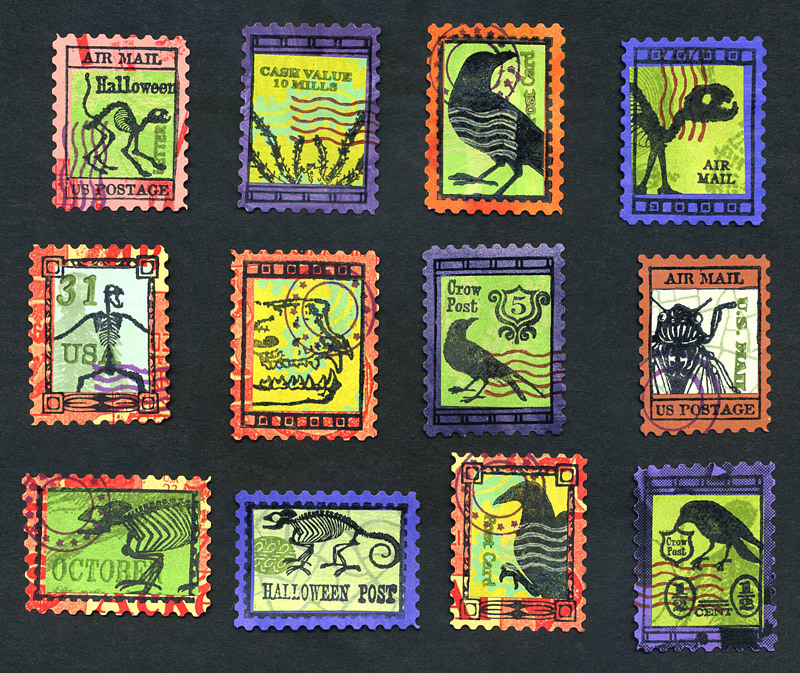 I also have a selection of Halloween and Faux Postage rubber stamps available in my online shop Carolyn’s Stamp Store. I have complete postoid stamps and parts to help you design your own artistamps. Check out my newest designs featuring skeletal animals, crows, creepy bugs and more! For about 10 years I have sent cards to celebrate the New Year instead of Christmas. Why do I do this? One reason is that I like to design my own cards, and everyone on my list does not celebrate Christmas, so a New Year card saves me from having to design multiple cards and remembering who celebrates Christmas and who does not. Another reason is that it’s different, and I never mind being different. Still another is that I make a lot of my own Christmas gifts and it’s difficult getting the gifts AND cards done all at one time. But the main reason is that the act of designing the cards reminds me of one of the best Christmas/New Year holiday seasons of my entire life and by making the cards I can have a private celebration of that memory to give me hope for the year to come. I was still in college and I had recently completed one of those design class projects where you are assigned to depict the four seasons in an abstract manner. We did one set with paint, and another with collage papers. 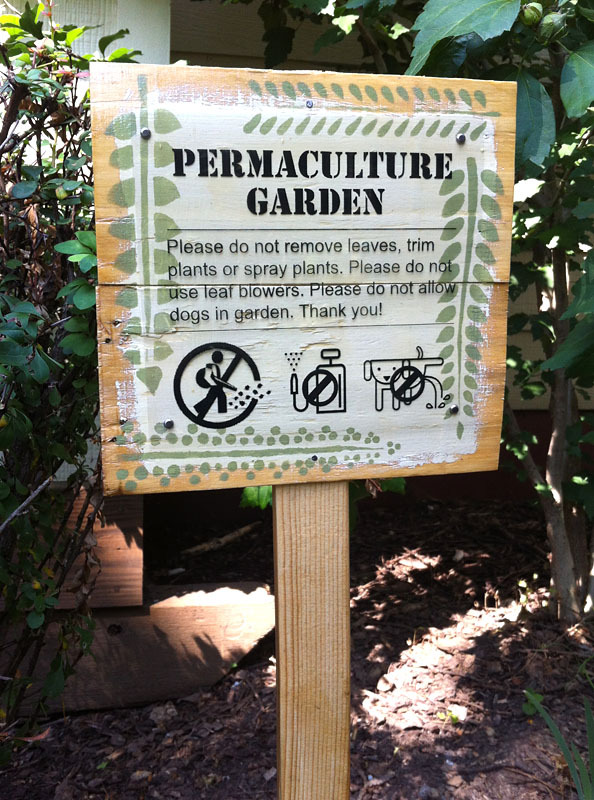 I was really enthusiastic about the project because I love to work abstract and I especially enjoyed the collage part. I was still fired up about collages when Christmas break of 1988 came around and I didn’t want to stop doing them. During the break between Christmas and New Year I had some rare time off from both work and school and I was able to work on some projects just because I wanted to do them. My uncle had given me a new Devo tape (one of my favorite groups of the 80s) for a Christmas gift and I listened to that over and over while I worked on several collages that I was really pleased with. I thought they were the best work I had ever done up to that point and I used ideas I developed during those few days for spinoff projects for some time to come. 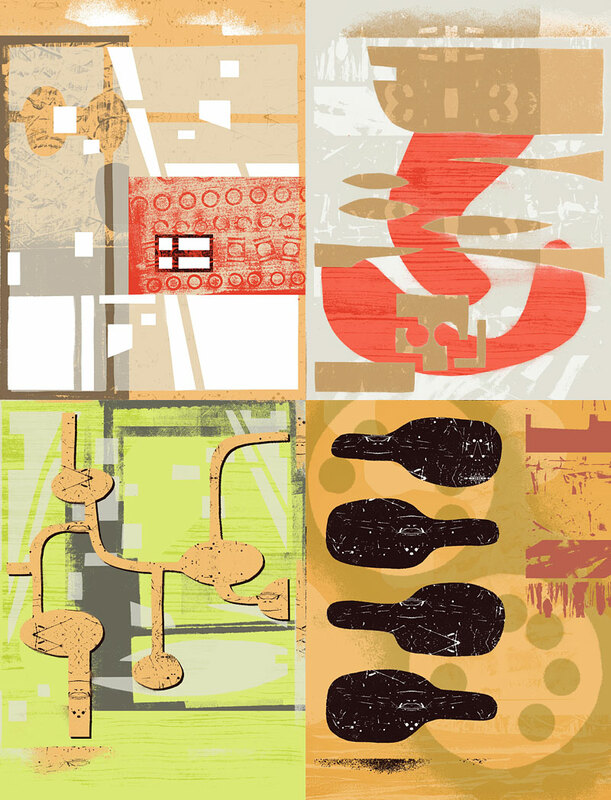 One of the pieces was a collection of “thumbnail” collages in a Mid-Century modern style that I still keep in my studio and still periodically get ideas from. I will never forget what that burst of creativity was like, it’s hard to describe but I felt fully alive and purposeful for one of the first times in my life. It’s a feeling I’m always working to recapture and I do succeed from time to time but it is not easy to get “in the zone” like that. For this year’s design I decided to do a four seasons treatment, using collage in a sort of DADA/Constructivist style. Those kinds of pieces are typically either chilling, disturbing or both so I watered down the type if imagery I’d normally use for that type of collage because I wanted to convey a positive feeling about the New Year! I used my collage paper collection that I’ve been building up since 1985 and mostly let the colors carry the message. I did a little bit of editing with the computer after scanning the collages to finish them off and size them for cards. Each card recipient is going to get one of the four seasons at random this time, instead of everyone on the list getting the same card. I wish everyone a creative New Year in 2015! Sometimes the pieces of scrap paper I put under my rubber stamping projects to protect the work surface from ink end up with really interesting markings on them. Don’t throw these pieces out – when they’re dry, scan them and import them into Photoshop to make interesting textures that would be difficult if not impossible to duplicate with only digital tools. Click here for Analog to Digital: Waste Paper From Stamping Projects Can Enhance Photoshop Art.